After you create an invoice you can accept payments from the system in many different ways. If the Credit card is on file, the system will deduct payment from the card. You can have upto 3 cards on file and the system will ask you as to which card you would want to use for the payment. The admins can accept Check/Cash payments from theirs customers by choosing New Payment Method. 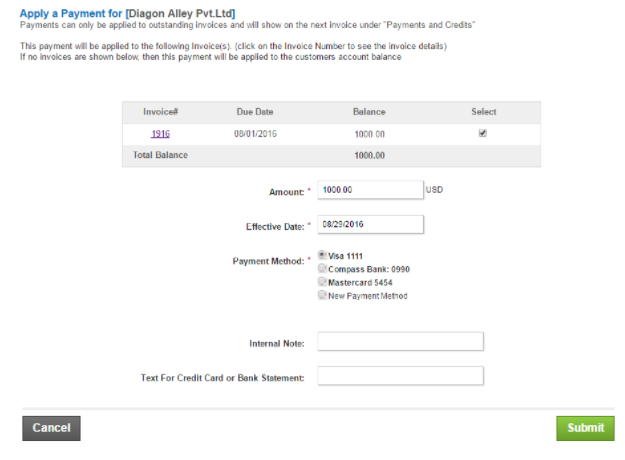 On choosing the appropriate payment method, the system will show you the applicable fields to be filled. On clicking Submit, the applicable payments can be recorded in the system. 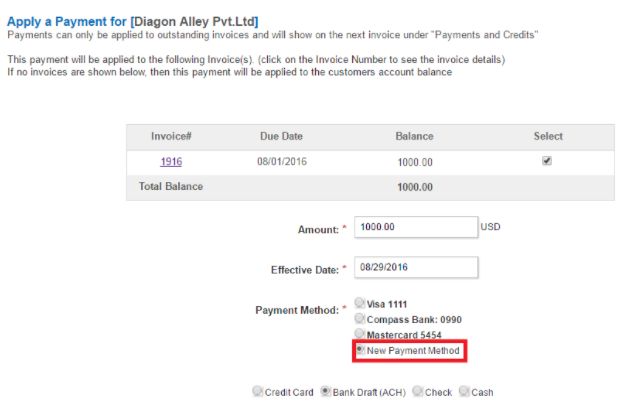 The Invoice Templates can be changed by going to System>>Invoice Templates where the Web view and the .pdf templates can be changed. The end users can store their Credit Card Information in their profiles. As you can see, the end users can store more than one payment method in the system. You can also setup payment retries by navigating to System>>Configuration>>Payment Retries if the payment does not go through the first time based on number of days or months.